Fibromyalgia and a New Paradigm? In the article “Small Nerve Fibers and Fibromyalgia: Five Signposts to a New Paradigm” Nurcan Üçeyler wants to convince us, that science should reverse its course and leave CNS studies and go back to peripheral nerves. I don’t see that this is a signpost for peripheral nerve studies. That’s a statement! A study of N=25 doesn’t say much. “Patients were recruited from all over Germany”. How strange, as there is an abundance of people being afflicted with fibromyalgia. Why look all over Germany and handpick people for a study? Why test these 25 patients against depressive patients? Why not against patients suffering from chronic back pain? Another point that won’t pass as a signpost. Another strange idea. Fibromyalgia is considered to be a chronic pain disorder and isn’t considered to be a form of depression. Let’s erase this signpost, too. Let’s call it an unproven hypothesis and not a signpost. I don’t see a signpost in this statement. It shows that it’s more than premature to talk about a change of paradigms. The author thinks that future studies on small fibre damage could be the “basis for the design of specific analgesic drugs.” Drugs haven’t been a big success in fibromyalgia and won’t be as pain processing in the CNS is involved. Why should the development of a new drug against small fibre neuropathy be stimulated by these findings? I don’t want to call someone off research as also dead ends allows conclusions, but don’t call a dead end a change of paradigms. This is a very basic guide to Mandarin Chinese. You might have read my very basic guide to Russian or Japanese; if not, please look for the reference / link at the end of this blogpost. I've studied Chinese in Germany and in Taiwan (台大和师大国语中心). Learning how to write takes some time and effort and would be worth it, but if you intend to go on a business trip for a couple of days or go on a short sightseeing trip, more than a few words would be too much. If you aren’t aware of the fact, here it comes: Chinese is a tonal language. The 1st tone is high and even, the 2nd tone is rising, the 3rd tone is falling and then rising again, while the 4th tone is sharp falling. On the very basic level you will probably be understood, even if you don’t get the tones right. Most Chinese will in fact congratulate you on trying to speak their language. 1st [-], 2nd [´], 3rd [`´] and 4th [`], sometimes a tone isn’t pronounced, so there might be one syllable without a tone. And sometimes tones change. Yes – OK let’s start with a problem, yes always comes out of a context, but most of the times you would be right with shi` (是), literally it is, you can also say dui`(对), which mean true, if it concerns having, you can say you`´ (有), meaning have and being pronounced like in the yo-yo in rap songs. No – no is corresponding, most of the times you would be right with bu´ shi` (不是), literally it isn’t, you can also say bu´ dui`(不对), which mean no true, if it concerns not having, you can say … OK here is a another trap mei´ you`´ (没有), meaning don’t have. Please don’t stop here, even if it looks less simple than Hindi or Arabic or Russian. Please – qing`´ (请) we’re at the forth word and there’s another hurdle, q has nothing to do with an English q (and nothing at all with Q from MI6), it is pronounced more like the ch in cheap. „Vitamin C unterstützt eine normale Kollagenbildung für die Funktionalität der Knochen. Mangan trägt zu einer normalen Bindegewebsbildung bei. Kollagen und Mangan sind wichtige Bausteine des Bindegewebes. Vitamin C unterstützt wirklich die Bildung von Kollagen. Und ja, Kollagen oder Bindegewebe haben „im Körper vielfältige Aufgaben als Bestandteil des Knorpel- und Knochengewebes“. Aber muss man deshalb Hagebuttenextrakt mit Brennnessel und Teufelskralle zu sich nehmen. Nein. Vitamin C bekommt man am besten aus frischem Obst und Gemüse. Die durchschnittliche Manganversorgung ist deutlich besser als der Bedarf. Der Bedarf wird mit 1 mg Mangan täglich angegeben, die Versorgung beträgt aber 2,5 mg. Deshalb ist die Werbung mit zusätzlichem Mangan so überflüssig wie das Präparat. Als Tagesdosis werden 40 ml angegeben, die auch nicht überschritten werden soll. Hier hat man wahrscheinlich Angst vor einer Überdosis an Betakarotinoiden, die z.B. Bronchialkrebs fördern könnten. Wobei ich da etwas skeptisch bin, ich glaube eher, dass es nur bei künstlicher Zufuhr von Betakarotin der Fall ist, aber dies ist nicht bewiesen. Was kostet der Spaß? „Flasche(n) RosaXan. Preis pro Fl. 23,50€, zzgl. 4,80€ Porto. Ab 6 Fl. Portofrei.“ Das heißt es fallen Tageskosten von 1,25 Euro oder Jahreskosten von 457,46 Euro an. Ich rate ab. PS. Hagebuttenmarmelade selber herstellen ist arbeitsaufwendig. Ich esse gerne Hagebutten im Winter direkt vom Strauch, die Kerne sollte man ausspucken. I had seen an advertisement in a German magazine called tina "the premium women's magazine" No. 16 of the 10.04.2012 edition, p. 65, concerning Krill Omega Red Oil. We see Kirsten, a "busy and helpful lady" in retirement. She has dressed up for the poster in the colour of the advertised product. The ad wants to tell us, what "krill Omega unlike fish oil" can do. In the first paragraph after under the title "I look after my heart" but no difference to fish oil is presented. Then addressed as"the secret of krill Omega", the krill capsules are described as odor-free - same applies to the salmon oil capsules from ALDI, Lidl & Co.[German discounter chains]. Secondly, it is claimed that krill is a more effective source of than omega-3 fatty acids than fish oil . "1 Capsule contains: 200 mg phospholipids, of which 60% are omega-3 phospholipids." 115 mg omega-3 fatty acids with the following composition: 50% EPA, 28% DHA and 22% other fatty acids. 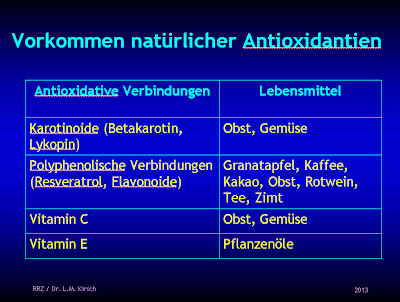 "Antioxidant: astaxanthin 25 µg." The ALDI (South) salmon oil capsule contains 191 mg omega-3 fatty acids, of which 148 mg are DHA and EPA (in a capsule of krill Omega there are only 90 mg). Well, there's something fishy! Moreover it's advertised, that krill oil comes from the most unpolluted sea - this may be true, but also the fish oil capsules are free of pollutants. Whether krill oil or fish oil can maintain heart health, is still under discussion. There is not a single study that describes an advantage of krill oil. Let's have a look at costs. 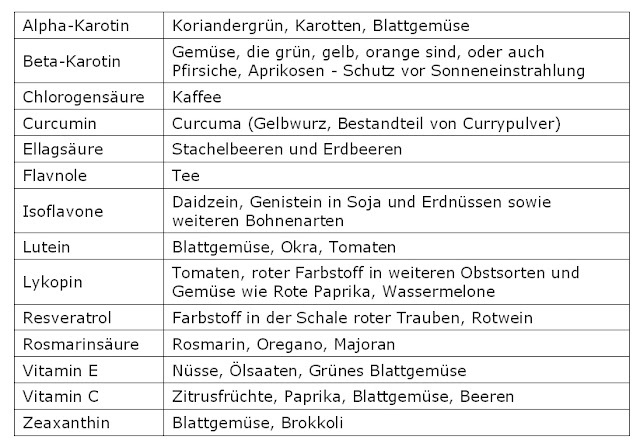 Most sites on the Internet charge about €27 for 60 pills [German sources]. At ALDI, you pay approx. 5 ct (approximately €3.00 for 120 capsules) per gram of fish oil. For Krill Omega Red Oil you'd pay a whopping €2.50 per gram of krill oil. Krill Oil is a by-product of the extraction of krill powder for animal fodder. Some colleagues are already telling patients that we only have a short while to bridge until Xeljanz® (tofacitinib) will be available in Europe. Now the Committee for Medicinal Products for Human Use (CHMP) of the European Medicines Agency (EMA) has adopted a negative opinion for Xeljanz® (tofacitinib) [treatment of adult patients with moderate to severe active rheumatoid arthritis]. The point hasn’t been an improvement in the signs and symptoms of rheumatoid arthritis, but the insufficient demonstration of a consistent reduction in disease activity and structural damage to joints. The CHMP has also been concerned about serious infections, gastrointestinal perforations, and malignancies as observed in studies. Pfizer will appeal this opinion and seek a re-evaluation of the opinion by the Committee for Medicinal Products for Human Use (CHMP). “We have confidence in XELJANZ and believe our application to the EMA demonstrates that XELJANZ has a favorable risk:benefit profile. XELJANZ’s safety profile is well-characterized, and the issues raised by the EMA, including serious infections, gastrointestinal perforations and malignancies, are familiar to rheumatologists who are experienced working with treatments for patients to manage this difficult disease,” said Dr. Yvonne Greenstreet, senior vice president and the head of the Medicines Development Group for Pfizer Specialty Care. I don’t think that we have to say goodbye to Xeljanz, but it will take more time until we will have access to a new class of drug treating rheumatoid arthritis. I've just received a PeerVoice update on novel Ooral Jak inhibitors. Prof. Ronald F. van Vollenhoven talked about tofacitinib in: "Recent Efficacy Data on JAK Inhibitors: How Well Will They Work for Your Patients?" Left side is after 6 months and right side after 12 months. If I would be on the CHMP I'd be convinced of a radiographic benefit. I hope that CHMP / EMA may be satisfied with a new appraoch to existing data as we have the patients waiting for a novel drug. The Committee had major concerns about the risk and type of serious infections seen with tofacitinib, which are due to the immunosuppressant action of the drug. Further safety concerns also included certain cancers, gastro-intestinal perforations, liver damage and problems with increased lipid levels in the blood. When the FDA approved Xeljanz, the drug had to carry a boxed warning regarding safety risks such as serious infections, including opportunistic infections, tuberculosis, lymphoma, and other cancers. 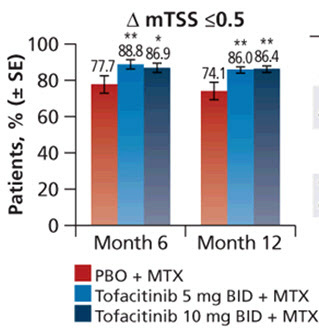 This is a setback not only for tofacitinib but for all protein kinase inhibitors. Pfizer was confident to launch Xeljanz in Europe early next year. How long will it take now? Will the FDA reconsider its’ approval? How about baricitinib, fostamatinib, GLPG0634, etc.? The next ACR meeting will be most interesting as some drug companies might consider to abandon or postpone their research programs on protein kinase inhibitors. I hope that Pfizer produces the needed studies to change Committee for Medicinal Products for Human Use (CHMP) opinion. Otherwise this novel principle to treat rheumatoid arthritis is at stake. Es gab Werbung für Vektor-Lykopin. Lykopin ist ein feststehender Begriff. 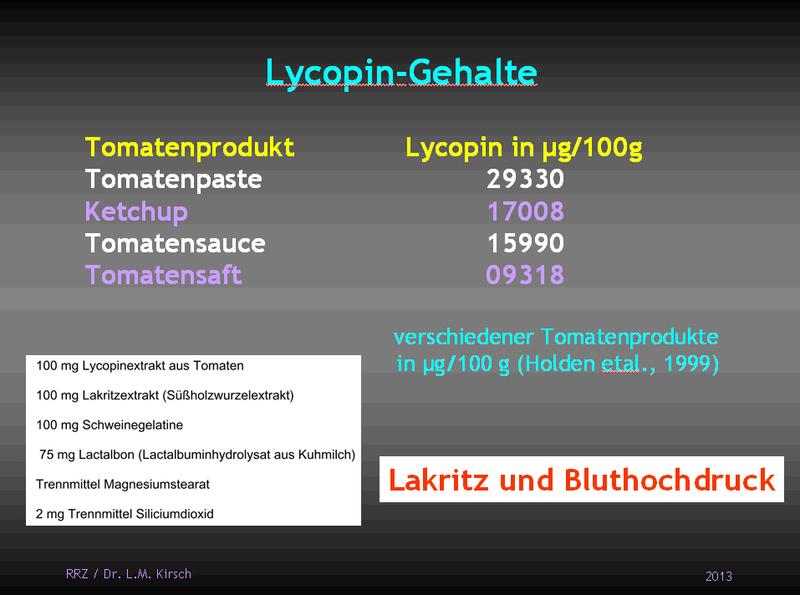 Es ist der Farbstoff, der Tomaten, Wassermelonen, Paprika und weitere rot färbt. Vektor ist ein Begriff, den die Marketing-Abteilung hinzugefügt hat; aus der Wissenschaft stammt der Begriff jedenfalls nicht. Ich war dann sehr überrascht, dass dem Lykopin das Wissen beigemessen wird, gezielt dorthin zu wandern, wo es wirken soll. Der Lykopingehalt des Präpates lässt sich gut mit natürlichem Lykopin vergleichen. Lakritz ist übrigens bei Bluthochdruck ungünstig, da es den Blutdruck erhöhen kann. • Unterscheiden sie sich von Medikamenten? Rechtliches Konstrukt: ein Nahrungsergänzungsmittel soll die allgemeine Ernährung ergänzen, als Konzentrat von Nährstoffen, die in dosierter Form in den Verkehr gebracht werden (nach der Nahrungsergänzungsmittelverordnung). Wenn also etwas in der Nahrung fehlt, soll dies ersetzt werden. Da wir uns im Grenzbereich zwischen Arzneimitteln und Lebensmitteln bewegen, ist nicht immer klar, wozu ein Präparat mehr zuzurechnen ist. In manchen Ländern ist der gleiche Stoff ein Nahrungsergänzungsmittel, im nächsten Land ein Arzneimittel. Darf mittlerweile nur mit belegten Heilsversprechungen beworben werden. Das wird allerdings bis zur Abmahnung durch die Wettbewerbszentrale häufig nicht eingehalten. Die Überwachung des Marktes erfolgt durch die Verbraucherzentralen nur ansatzweise. Das Bundesministerium für Ernährung, Landwirtschaft und Verbraucherschutz zeichnet sich bei Anfragen aus, dass es diese an Länderstellen weiterleitet, und diese Stellen leiten dann auch wieder weiter. Das irgendetwas sich ändert, bemerkt man nicht. 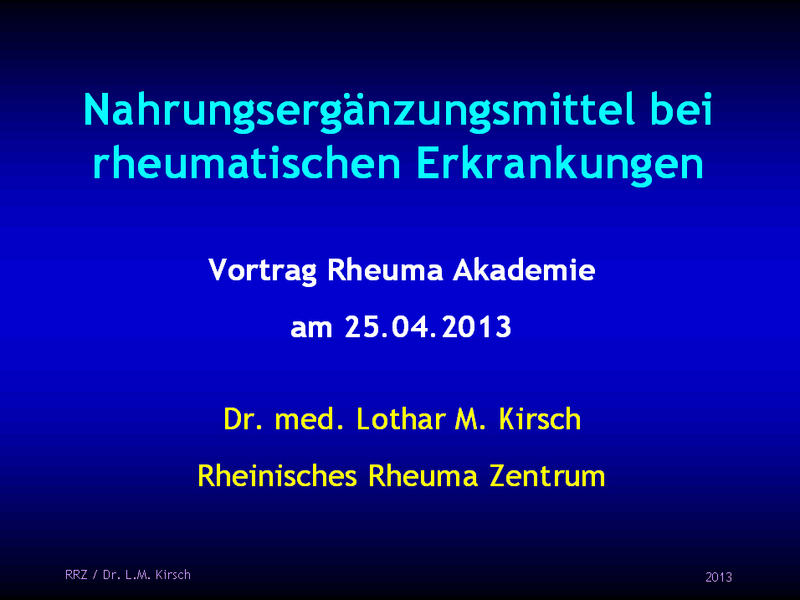 Siehe auch: http://rheumatologe.blogspot.de/2012/12/super-turmalin-entgiftungspflaster.html. Die Antwort ist ein klares Jein. Denn manche Nahrungs-ergänzungsmittel sind sinnvoll, aber leider sind die meisten völlig überflüssig und stellen nur eine massive Attacke auf Ihre Geldbörse dar. Für die Beschreibung der Natur ist die Normalverteilung von Bedeutung. Zum Beispiel sind die Laborwerte so verteilt und man berechnet daraus einen Bereich, den man zum Normalwertbereich erklärt. Eine solche Kurve wird hier gezeigt: http://wirtschaftslexikon.gabler.de/media/873/50816.png. Vitamine oder Mineralstoffe künstlich zu erhöhen ist nur sinnvoll, wenn ein Mangel besteht, gibt man zu viel, dann ist genauso ein Schaden möglich als hätte man zu wenig. Bei der Einnahme von Nahrungsergänzungsmitteln wird häufig auf diese Warnung verzichtet. Besonders aber bei der Orthemolekularmedizin, die mit Megadosierungen arbeitet. Es gibt auch den Mangel ausVerlust, z.B. 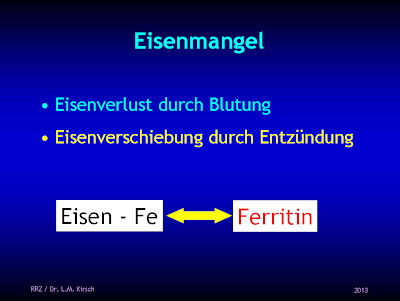 Eisenmangel durch Blutung. • Omega-3-Fettsäuren hingegen stellen ein Problem dar, denn die vegane Kost enthält durchschnittlich viel zu viele Omega-6-Fettsäuren; bei entzündlich-rheumatschen Erkrankungen ist das ungünstig. Es handelt sich um ein esoterische Ernährungsform, bei der erhebliche Mangelzustände möglich sind und auch schon aufgetreten sind. Hierzu sind zu nennen: z.B. die Vitamine D3, B2 und B12, sowie Kalzium und Eisen, sowie Eiweiß und Fett. Freie Radikale vermeidenEisen ist ein aggressives Element und es entstehen leicht freie Radikale, das sind reaktionsfreudige Molekülreste, die andere Moleküle oxidieren. Dadurch entsteht z.B. Entzündung. Auch bei der Entwicklung der Arthrose spielen diese freien Radikale eine Rolle. Der Körper schützt sich gegen zu viel Eisen, indem er die Ausnahme reguliert. Wenn Eisen, z.B. nach einem Blutverlust, fehlt, erleichtet er die Aufnahme. Vitamin C erleichtert die Aufnahme, schwarzer Tee erschwert sie. Genügend Eisen ist notwendig, überflüssiges Eisen ist schädlich. Nikotinabusus führt übrigens ebenso zur Vermehrung der freien Radikale. Wir wissen mittlereweile, dass die entzündlich-rheumatischen Erkrankungen bei Rauchern deutlich schlechter verlaufen und insbesondere die teuren Medikamente schlechter wirksam sind. Wir wissen mittlerweile auch, dass Patienten mit chronischen Schmerzsyndrome, die rauchen, deutlich mehr Schmerzen zu erleiden haben. 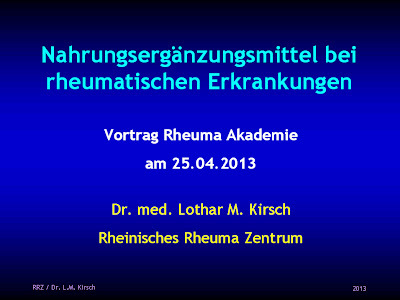 Deshalb ist es wichtig, bei Schmerzen oder entzündlich-rheumatischen Erkrankungen sofort mit dem Rauchen aufzuhören. Vitamin D3 ist einerseits ein Hormon, das der Körper selbst herstellt, aber andererseits auch ein Vitamin, das der Körper aus der Nahrung aufnehmen kann. Der Gehalt in der Nahrung ist schwankend und insgesamt geringer als die Menge, die wir selber herstellen. Für die Herstellung von Vitamin D3 benötigt der Körper aber Sonnenlicht und insbesondere kurzwelliges UV-Licht. Im Winterhalbjahr steht die Sonne jedoch so tief, dass wir vielleicht noch bräunen könnten, aber nicht ausreichend Vitamin D3 herstellen können. Die USA, die 10°-20° südlicher liegen, haben dieses Problem auch, aber sie haben eine gesetzliche Versorgung über Vitamin D3 angereicherte Milch - und damit sind alle milchartigen Produkte, auch die vegetarischen Alternativen gemeint. Bei uns ist eine Substitution sinnvoll. Bei Patienten z.B. unter Glukokortikoiden ("Kortison") ist das über Kombinationspräparate, die Kalzium und Vitamin D3 enthalten, möglich. Der allgemeinen Bevölkerung kann man Dekristol 20.000 IE alle 14 Tage empfehlen. Kalzium und Eiweiß - wenn die Kalziumquelle reich an Eiweiß ist, wird zur Pufferung von frei werdenden Säuren Kalzium benötigt. Kalzium und Phosphat - bei Phosphaten besteht ebenso das Problem, dass der Körper Kalzium benutzt, um zu binden. 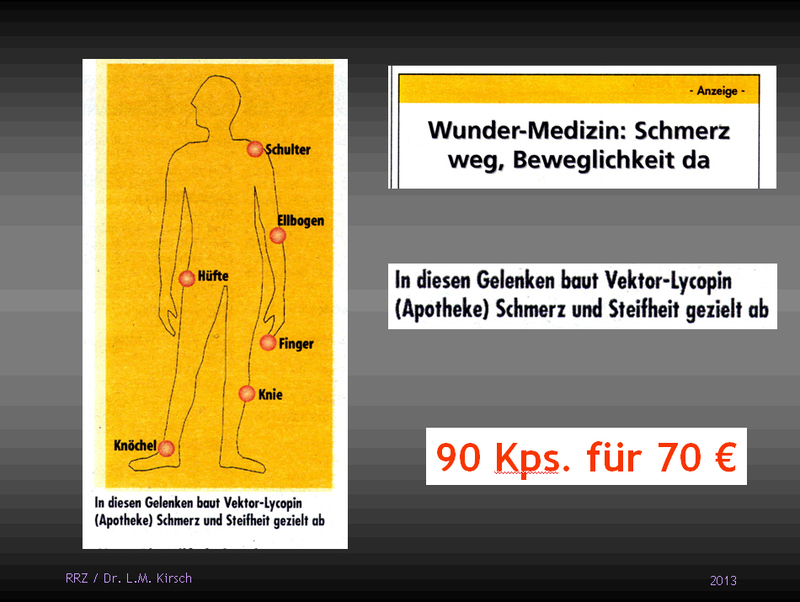 In dem oben genannten Artikel vom bayrischen Osteoporose Zentrum kommen die Mineralwässer nicht gut weg. Das stimmt für die meisten sogar, insbesondere die teueren, Jet-Set-Wässer nicht erstaunlich arm an Kalzium. Mein Bruder hat aber herausgefunden, das z.B. Steinsieker 620 mg Kalzium pro Liter enthält und sich mit dieser Art von Mineralwasser der Kalziumhaushalt gut beeinflussen läßt. Es gibt nur wenige Patienten, die Kalzium und Vitamin D3 nur unter ärztlicher Kontrolle nehmen sollen: z.B. Hyperkalzämie, Nierensteinen oder Niereninsuffizienz. • 90 Kps. kosten um die 14 €. So wird Hübner arthoro® arthrose beworben: „Arthoro® arthrose dient der diätetischen Behandlung von akuten, arthrotischen Gelenkschmerzen.“ Das kann das Präparat nun schon gar nicht. Wie soll etwas, das langfristig den Knorpel aufbauen soll, akute Schmerzen beheben? Der Spaß kostet aktuell 25,99 Euro im Monat. Leider kann ich nicht entdecken, wie viel Hydroxyprolin im Präparat sind. Aber vielleicht hilft die folgende Angabe weiter: 100 g Eigelb enthalten 1,2 g Prolin. Die Grünlippmuschel soll wahre Wunder wirken. Sie kommt in Neuseeland vor. „Wertvollster Bestandteil dieser neuseeländischen Muschel sind die Glykosaminglykane (GAG).“ Nein, denn der größere Teil der 60.000 Tonnen Grünlippmuscheln, der in den Handel kommt, wird einfach verzehrt, denn die Muschel gilt als Delikatesse und wird deshalb in großen Aquakulturen gezüchtet. "Dr. Budwig´s Omega-3 Energiemix ist eine ballaststoffreiche Mischung aus Leinsamen, Sonnenblumenkernen, Weizenkeimen und Fruchtflocken." 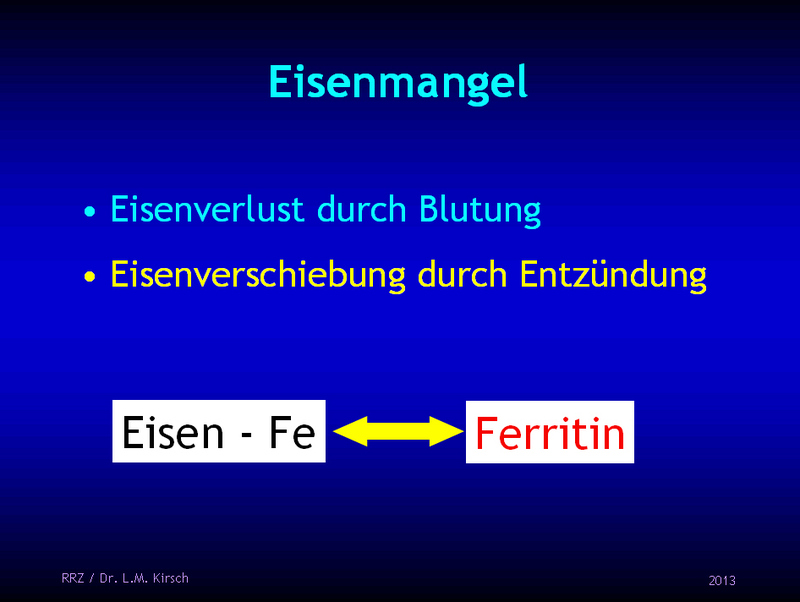 Warum Energiemix? Bei Omega-3-Fettsäuren geht es nicht um Energie. Warum Sonnenblumenkerne? Die sind doch gerade reich an Omega-6-Fettsäuren. Wozu denn dieses überteuerte Präparat (28,29 EUR pro kg - und das ist verdünnter Leinsamen!)? Holen Sie sich frisch geschroteten Leinsamen aus Ihrem Bioladen (ca. 5 EUR pro kg), eine Müslimischung und Magerquark oder Hüttenkäse und machen Sie selbst eine Mischung daraus. Denken Sie daran, dass etwa zwei Eßlöffel Leinsamen pro Tag völlig ausreichen, den Mangel auszugleichen. Ich halte Aroniasaft für eine gute Quelle für Anthozyane wie z.B Blaubeeren oder Holunder, jedoch ... wie sieht es mit dem Preis aus? Der Hauptvermarkter („Wir sind Aronia!“) bietet verschiedene Säfte an, die dann 6,50-17,00 Euro pro Liter kosten. "Jede Mahlzeit wird sozusagen zur Null-Diät." 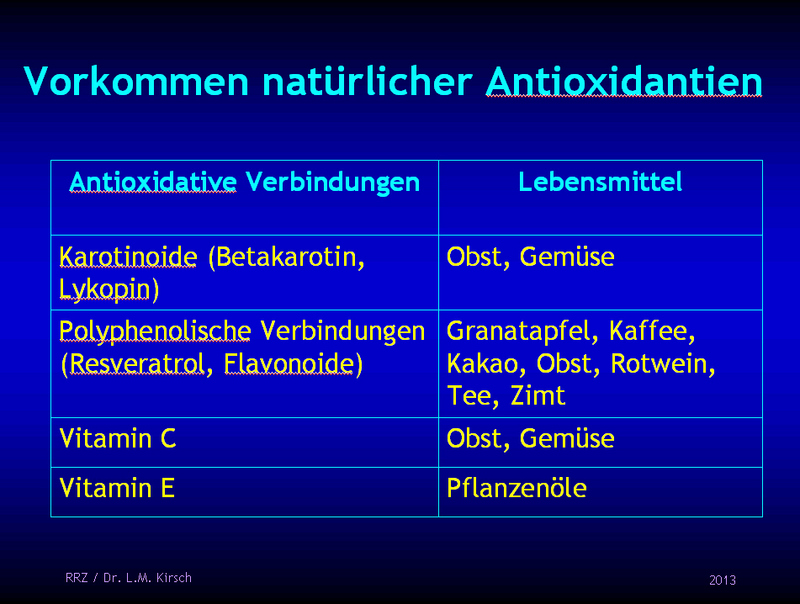 „ausgewogene Hormontätigkeit und gesunden Energiestoffwechsel"
Inhaltsstoffe: Vitamin C, Zink, Eisen, Betakarotin, Vitamin B6, Synephrin, Aminosäuren, Pflanzenstoffe. Jesus wurde 40 Tage in der Wüste vom Teufel versucht. Té chino, also chinesischer Tee, warum also auf Spanisch? Inhaltsstoffe: Schachtelhalm, Pfefferminze, grünem Tee, Brennnessel, Mate grün, Süßholzwurzel und Löwenzahn. Werbeversprechunge: „kalorienreiche Verlockungen verlieren ihre Verführungskraft“. ein nicht ganz richtig geschriebenes mei (美), ein zhen (真) und ein ai (爱), schön, wirklich und Liebe. Eine Packung zu 100 g kostet 33,32 Euro. 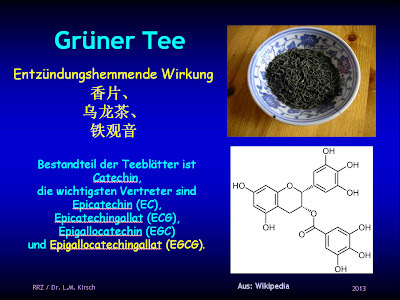 Grüner Tee hat entzündungshemmende Wirkung und ist im Chinaladen deutlich preiswerter zu bekommen. You might have seen these paper strips at Japanese Shinto Shrines and Buddhist Temples and wondered, what the meaning behind these papers is. It’s called o-mikuji (おみくじ / 御神籤) in Japanese.